Railing in several styles, vertical and inclined ladders, flight deck safety nets and antennas, radars (SK-2, SPN-6, SR-2, SPS-6, SPS-8A, SPS-29/37, SPS-43A, SPS-10, SPS-12, SPS-48, SPS-49, SX, Mk, 12, & Mk, 22, & YE beacon), accommodation ladders, Flight deck catwalk ladders, D.F. antennas, Flight deck edge antennas, ECM antenna support, Tillie crane boom, LSO windcreens and nets in several styles, sponson cranes in several styles, flag bags, elevator girders and safety nets in several styles, funnel cap grilles in all required styles, jet blast deflctors in all required styles, mast yardarms and mast platforms, flight deck safety nets for all classes, watertight doors, ship's screws, 20mm Oerlikon Cannons and armor shields,ship's boat rudders, aircraft propellers, and helicopter rotors in several styles. 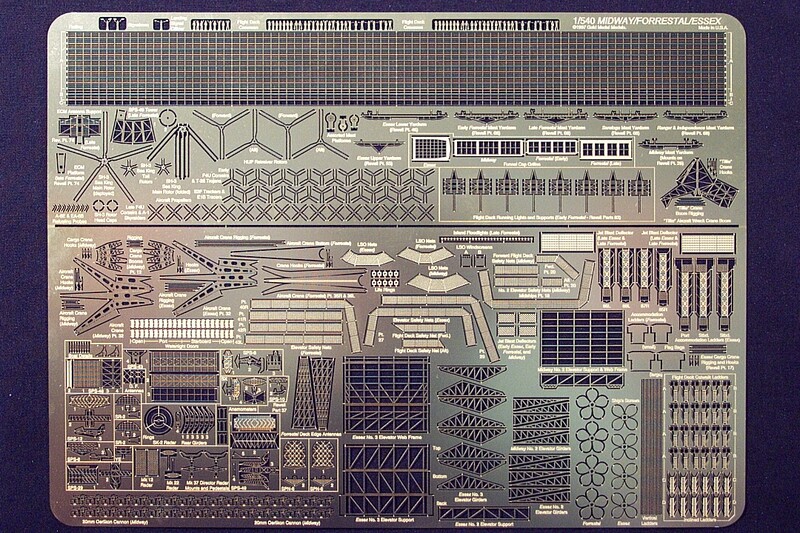 Fits classic Revell kits of post-war Midway, Forrestal, and Essex-class aircraft carriers. SEE PHOTOS AND A REVIEW OF GMM'S 1/540 Midway/Forrestal/Essex DETAIL SET!